Why Give to the Catholic Unattached Directory? God is the author of marriage and good marriages are the bedrock of a healthy society, and crucially provide by far the best enviroment for children to grow and flourish. 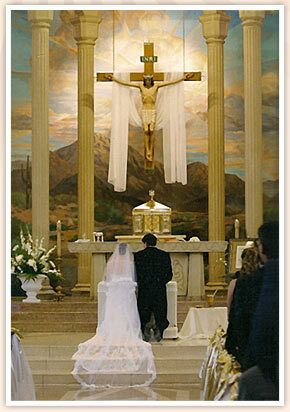 Good sacramental Catholic marriages are the gold standard, and a good Catholic marriage can bring a lifetime of happiness and grace. Support for such marriages is doubly important when such absurd abominations as gay "marriage" are foisted on society by the godless clowns who govern us. Your donations help with the design, printing and mailing out of posters to Catholic churches and other Catholic institutions. Your donations help cover the cost of promoting the service online via Google Adwords and similar. Your donations will help with the cost of web hosting, web design and programming etc. Your donations make it possible for us to advertise in Catholic periodicals. The more donations, the better we can promote the service and consequently more Catholics will benefit from it. We don't ask you to register or give us any personal details. Just select your preferred option below and then click the GIVE NOW button. As a THANK-YOU we encourage you to download a FREE copy of our ebook on love and marriage. This is a great classic that has the power to literally change the world for the better. "There is no exercise better for the heart than reaching down and lifting people up"
We solemnly promise that we will not rent or sell your information to any other charity. Your donation will appear on your statement very simply as "DONATION TO CUD"